Apple. A word my children most frequently associate with that logo on the back of their favorite electronic devices. I also adore my iPhone, iPad and iTunes. If being completely honest, maybe a little too much. Being plugged in; it’s a national past time. This year as I prepare to celebrate this season of harvest and thanksgiving with my family, I am realizing how much I have begun to appreciate this holiday. I, like so many others, enjoy keeping in touch with family and friends on Facebook, Twitter and even this blog. Following posts keeps me connected with so many by removing the barriers of distance and time. It is so convenient. Technology. It even coordinated who will bring what to our family’s dinner this year. No phone calls necessary. Yet, despite all the posts, texts and emails I find myself looking forward to connecting with family, friends and neighbors over a meal around the family table. Which leaves me wondering, what is it exactly that this holiday, Thanksgiving, provides? Is it the food that I am craving? I don’t believe so. I make pumpkin crunch cake all year long. Besides, food photography today is so advanced that it addresses many seasonal cravings. The hot steam swirling above a cup of mulling cider can not only be captured in an image, but enhanced to a point where I swear I smell the hovering wafts of cinnamon and cloves right across the Internet. Do I long for the warm ambience of home and hospitality that is at the very heart of this season? I don’t think so. I am very blessed in this regard. Further with just a click or two on Pinterest I am invited into the homes of so many. A virtual holiday housewalk with all the trimmings at my fingertips. Ambiance galore pinned to a board. Is it the sounds of conversation that I desire? No. Living in a home with three young boys conversation abounds. And today’s high quality video clips not only animate the faces of those I love but record their voices with amazing clarity. Clips of my cousin singing or my three nephews laughing collapse distance and bring me into their every day activities. And I am grateful. Grateful for technology, social media and all things innovative that allow me to so easily connect with the world around me. It occurs to me, that all these things will never replace my need to be in the very presence of those I love. All those other things are just substitutions, born out of that very need. That human need for companionship created in that garden so many years ago. I believe it is this, and not our country’s love of turkey, pilgrims or pumpkin pie that drives so many Americans to crowd the nation’s highways and airports this time of year. And in the spirit of being present, the only “apples” that will be invited to dinner are those found in our traditional and seasonal salad. I love this salad. It is one I often choose when asked to bring a dish to a celebration. It’s been to many Thanksgiving dinners, pot-luck style baby showers and even a teacher appreciation luncheon or two. Why? It’s a breeze to toss together. Even easier to transport. And there are never any leftovers to bring home. In my mind, always the truest sign of a crowd pleaser. The simple flavors of apples, cashews and Swiss cheese are smashing together. 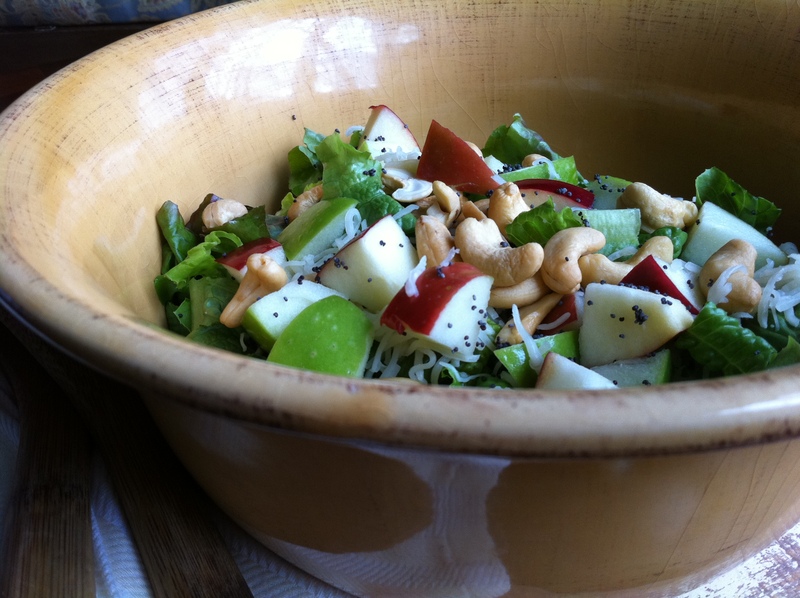 The sweet poppy seed dressing clings nicely to the leafy lettuce and balances the tang of the apples. 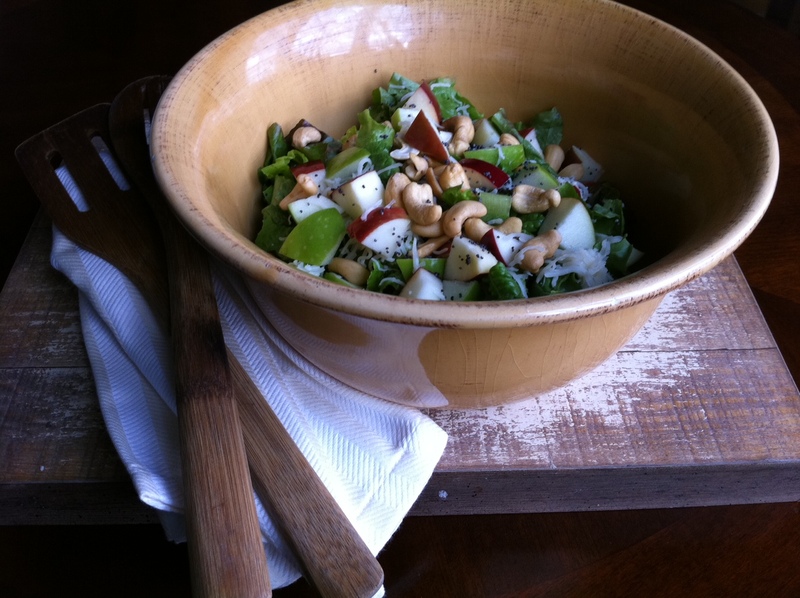 The crunch of the apples and cashews pairs so well with the silkiness of the cheese. It’s flavors are subtle and delicious. Better yet, they never overpower the other flavors of a larger meal. 2 red apples, coarsely chopped Sometimes, a combination of McIntosh, Honeycrisp & Granny Smith Green Apples is festive. 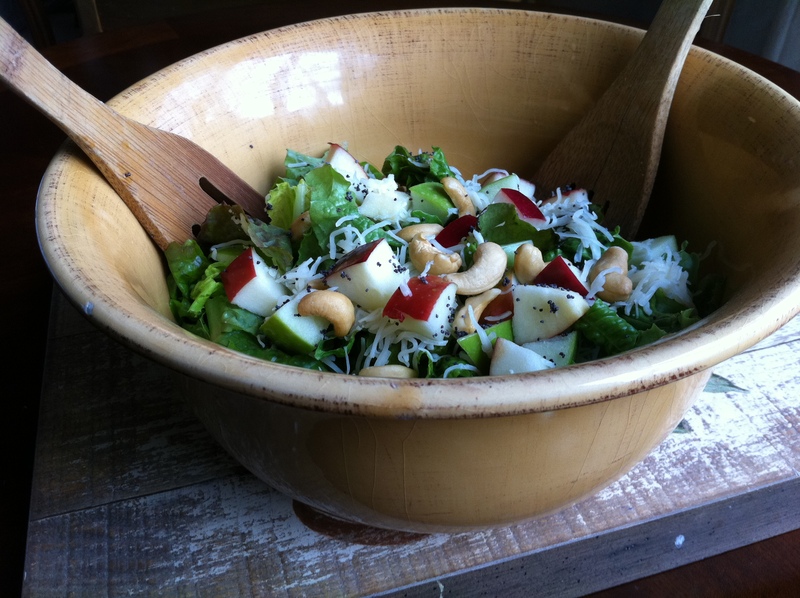 (Note: If salad is prepared ahead of time, be sure to coat apples in lemon juice so they do not brown). Recipe by Lisa and shared with me by Lynne. Lisa will be thrilled you used this recipe. I love the way you write. And your photos are awesome too. Glad you enjoyed! Thank you for letting me know and your encouragement. I love comments :).